The two types of peony are the herbaceous perennial peony and the tree peony. Herbaceous perennials die back in the winter and send up new shoots in the spring. In contrast, the tree peony is a woody shrub. Tree peonies are a deciduous tree that drops its leaves in the fall and winter while retaining a woody trunk and branches from year to year. 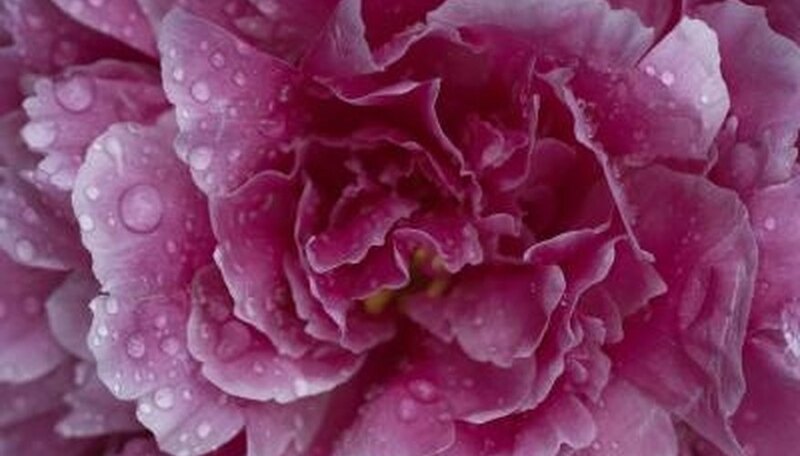 Propagating tree peonies from seed is not a rapid process, but with patience, these flowering shrubs mature and bloom in three to five years. Obtain a 4-inch planting pot that has holes in the bottom. Use one 4-inch pot for four or five seeds. Use multiple pots for more seeds. Start tree peony seeds in the summer or early fall. Fill the pot with seed starting mix. Use a blend of equal parts peat moss, perlite and vermiculite to start tree peony seeds or pick up a bag of premixed material at your garden center. Make four or five holes in the soil of each pot 3/4 inch deep. Drop one tree peony seed into each hole and cover with 3/4 inch of soil. Place the pots containing the tree peony seeds in a sink or outdoors and water until liquid runs out of the holes in the bottom of the pot. Keep the soil around the tree peony seeds between 70 and 80 degrees Fahrenheit until they germinate. Successful germination is indicated by the presence of roots growing out of the bottom of the pot and takes between six weeks and five months. Water so that the soil is damp at all times during the germination process. Retain moisture in the soil by putting the pots in a zip top plastic bag. Move the peony seeds to an area that is between 35 and 40 degrees Fahrenheit when the seeds germinate. A spot in the back of the refrigerator works well. Tree peony seeds require a period in warm soil followed by a period in cold soil to grow and develop. Check the seedlings in the refrigerator once or twice a week and add water when the soil starts to feel dry. Keep the pots in the plastic bag to help retain moisture around the tree peony seeds. Remove the tree peony seeds from the refrigerator after six to eight weeks when small shoots begin to emerge. Transplant the tree peony seedlings into individual 4-inch pots filled with standard potting soil. Keep the seedlings in a greenhouse or other protected area where they will get bright light throughout the day. Transplant the seedlings into the garden in the second spring of growing them. In Northern climates, plant tree peonies in full sun. In Southern climates, plant tree peonies where they will get morning sun and light afternoon shade. University of Vermont Extension; Tree Peonies; Jerry Meyer, et al.